So beautiful. Just stunning. Thank you. Especially the first one. I also want to say that I find them even more striking here, in smaller size and with some white space around them, than I do on your blog, Loren. I’m not sure why. I have nothing against large photos. Indeed I’m sure details are lost at this small size. Maybe it’s the texture and shine of the computer screen that gets between me and the photo more when more of the screen is occupied? The more I look back at your blog, the more this seems an odd reaction on my part – the image quality there is so high. I did have it, though. I’ve enjoyed both of these so much, Loren. Gosh, I was sure the first was a painting or colored pencil drawing. Then I took in “Two” photographs. Closer inspection still looks drawn! And the second one is so sweet and delicate. Well, Photoshopped might be a more accurate title than photographs, leslee. The second shot is slightly cropped but is pretty much straight out of the camera. 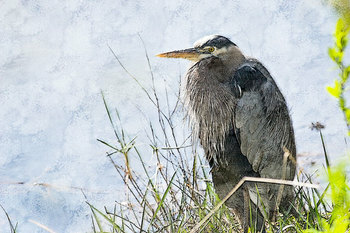 The first one started from a closeup of a Great Blue Heron, but it has suffered considerable manipulation in Photoshop. 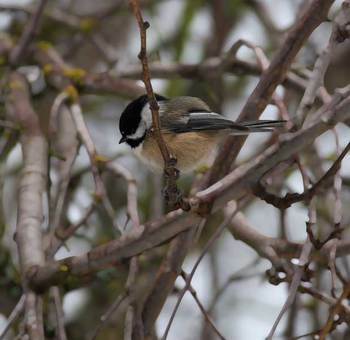 After spending a long time looking at the pictures great bird photographers took, I decided I prefer a slightly more “artistic” approach, at least until I can buy a 600mm lens and sit still for more than a few minutes at a time.